The Worcester Railers entered the final weekend of the ECHL’s regular season needing a lot of things to go right for them to make the North Division playoffs, with only one of those things under their control: winning. 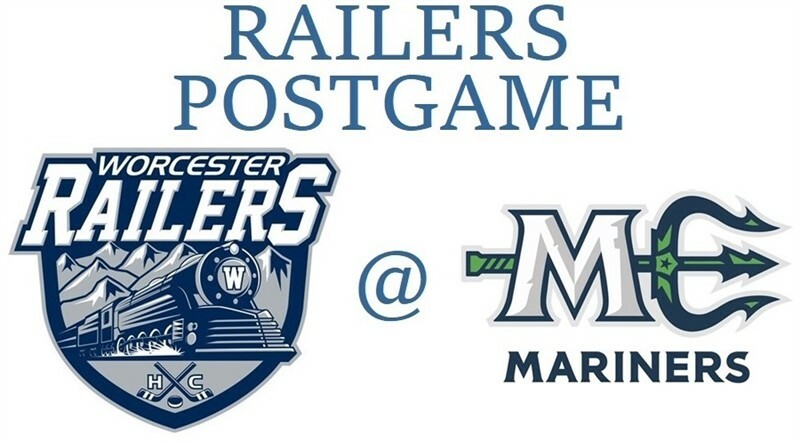 Having lost seven in a row the Railers needed to break out of that streak with a victory in Maine against the Mariners. As you can tell from the headline, they didn’t. When fans look back on this game they will point to two things that played a huge role in Worcester’s elimination loss, the first being Railers Head Coach Jamie Russell deciding to start rookie netminder Blake Wojtala over the more experienced Mitch Gillam. Russell pulled Gillam from Wednesday’s game, a contest that would eventually see Worcester lose 4-3 in overtime, in a move that didn’t sit well with many. Gillam is 4-0-2-2 vs Maine, with a 2.42 GAA and .923 save percentage, so if Gillam is healthy there’s no logical reason why he wasn’t in net Friday. The second was when referee Jesse Gour, who this writer thinks might be the worst in the ECHL, and that’s saying something when you look at the other ones, called Yanick Turcotte for a boarding major and a game misconduct at 12:11 of the opening period after he hit Josh Couturier with a check behind the Maine net. Couturier went down like he was shot and somehow didn’t make it back to his feet until Turcotte was ejected, but managed to recover enough to not miss a shift in the second and third periods. There’s apparently no video online of the check, but watching the stream of the game last night the play probably didn’t even deserve a minor. Three first period power play goals for Maine later and it was just about over for the offensively challenged Railers. Maine would add an even strength goal in the second to make it 4-0. The Railers would get one back at 16:44 of the middle period when Josh Holmstrom tipped a Mike Cornell blast past Mariners goaltender Francois Brassard. Matt Schmalz had the secondary assist on the goal. Schmalz would make it a two goal deficit at 13:03 from the slot just outside the left circle. Tyler Barnes and Connor Doherty had the helpers on that goal. But that was as close as Worcester would get as time ticked away on any meaningful games left in the regular season. Well after the final horn sounded Brycen Martin crushed Cornell against the boards as Cornell was reaching toward the ice to pick up the puck. What could have, and perhaps should have, turned into a wild post game brawl ended up not being more than a manor altercation as the linesmen pushed Cornell off the ice. Sean Cornell, who I don’t know if he is related to Mike Cornell, tweeted video of the incident. Martin was given a cross checking major and a game misconduct, and will undoubtedly be hearing from the ECHL about the hit soon. Not that it will benefit the Railers at all. Scratches for the Railers were Evan Buitenhuis (14-day IR/lower), Ivan Chukarov, Matty Gaudreau, Kyle McKenzie (14-day IR/season), Tommy Kelley, Ross Olsson, Tommy Panico (14-day IR/season), and Alex Vanier (14-day IR/upper). Mitch Gillam was the back-up goaltender. Ryan Hitchcock played after missing most of the third period and overtime Wednesday when he caught a skate blade in the lower lip after falling after a face-off. Hitchcock got eight stitches in his lower lip, and wore full face cage Friday night. With his 15 penalty minutes in the game Yanick Turcotte now has 374 with the Railers, jumping him over Mike Moore (365) for 16th all-time in Worcester hockey history. Next on the list are Ed Campbell (379) and Brennen Evans (381). I have always been a huge proponent of using video review when it’s available to determine if a physical play warrants a major penalty and/or a game misconduct. Far too often, even in the NHL, because of the speed of the game referees don’t get a good enough look at the play to really determine if a hit is worthy of such punishment. It’s even worse in the ECHL, with a single referee to watch the entire ice surface. Referee Jesse Gour certainly didn’t see enough the Turcotte hit to properly make the call, so why shouldn’t he be required to watch the video to see what he may have missed? On this day, April 6th, in Worcester hockey history: in 1996 the IceCats battled back from two goals down only to lose 3-2 in overtime in Springfield. Paul Broten and Harry York scored for Worcester, and Ken Sutton assisted on both goals. The Falcon won the game on a power play goal in extra time…in 2007 the WorSharks got goals from Riley Armstrong, Grant Stevenson, Mike Iggulden, and Graham Mink in their 4-1 win over Hartford. Thomas Greiss made an AHL career high 51 saves and had an assist in the game…in 2008 T.J. Fox and Brad Staubitz scored in the opening period and Mike Iggulden and Graham Mink had third period goals in the WorSharks 4-2 win over Springfield. Tom Cavanagh had two assists and Thomas Greiss made 20 saves. The 210Sports Player of the Game is Matt Schmalz. 1st Period-1, Maine, Cammarata 21 (Wallin, McNicholas), 9:57 (PP). 2, Maine, Fox 16 (Tolkinen, Martin), 14:12 (PP). 3, Maine, Cammarata 22 (McNicholas, Chase), 15:14 (PP). Penalties-Schmalz Wor (high-sticking), 9:48; Turcotte Wor (boarding – major, game misconduct – boarding), 12:11; Callin Wor (hooking), 16:35; Wallin Mne (diving/embellishment), 16:35. 2nd Period-4, Maine, Master 3 (Wallin, Coughlin), 9:59. 5, Worcester, Holmstrom 13 (Cornell, Schmalz), 16:44. Penalties-Martin Mne (interference), 0:31; Wallin Mne (tripping), 7:49; Cornell Wor (slashing), 13:17. 3rd Period-6, Worcester, Schmalz 9 (Barnes, Doherty), 13:03. Penalties-Holmstrom Wor (roughing), 2:56; Cammarata Mne (slashing), 2:56; Mueller Wor (slashing), 3:33; Cornell Wor (interference), 4:01; Doherty Wor (holding the stick), 4:59; Chase Mne (roughing), 4:59; Couturier Mne (tripping), 5:56; Cornell Wor (cross-checking), 10:26; McNicholas Mne (hooking), 10:43; Martin Mne (cross-checking major, game misconduct – cross-checking), 20:00. Shots on Goal-Worcester 9-14-20-43. Maine 12-4-6-22. Power Play Opportunities-Worcester 0 / 4; Maine 3 / 8. Goalies-Worcester, Wojtala 1-4-1-0 (22 shots-18 saves). Maine, Brassard 1-3-0-0 (43 shots-41 saves). Linesmen-Kyle Richetelle (73), Guillaume Brunelle (73).